HOUSTON – What do the Scanlan Building, Great Jones Building and BG Group Place have in common? They’re all located on Houston’s most expensive street for office leases, according to a study by Chicago-based JLL​. Central Business District’s Main St. is No. 21 on JLL’s list of the most-expensive commercial leases in the U.S.—the only street in Houston to make the list. The average full-service rent on Main St. is $44.24 per sf, nearly 45 percent higher than the average rent in Houston. Yet, the average rent on high profile streets across the nation are $48.65 per sf. Despite these high prices, the nation’s most expensive real estate on streets like New York’s Fifth Ave. and Washington, D.C.’s Pennsylvania Ave. is in high demand. Only 13 percent of the nation’s most expensive real estate is vacant, which is a full 250 basis points lower than the U.S. average. No. 14—Dallas’ McKinney Ave. at $51.17 per sf. 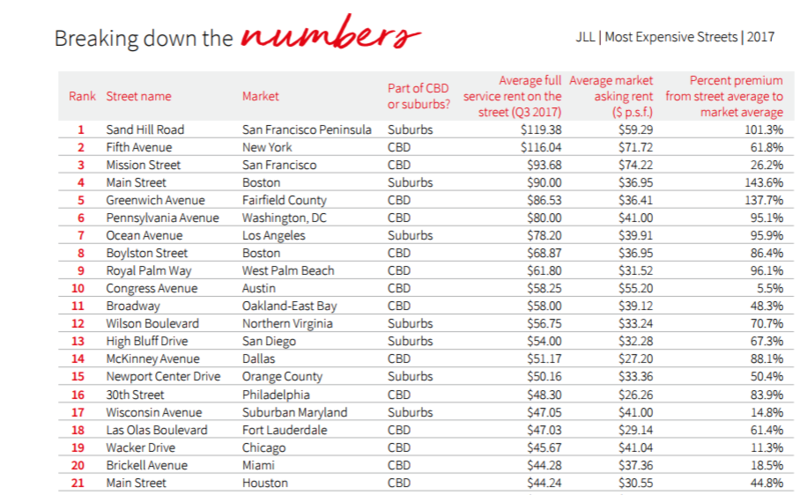 See JLL's Report 2017 Most Expensive Streets. ​Se​e also: Houston-The Woodlands-Sugar Land Office Market Research.